Or, in other words, it's beginning to look a lot like Christmas (literal translation: It Christmases much; you gotta love the German language!). 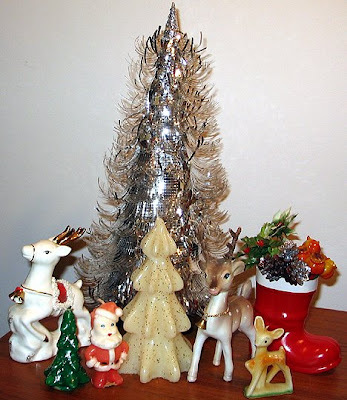 My little grouping of retro holiday figures welcomes you to this seasonal post! And they also qualify for Cielo of The House in the Roses' request to show some treasures. I still haven't gotten the house as decorated as I'd like (you can see decorations from last year here), and I only just decorated Piney, my Norfolk Island pine that I use as my Christmas tree, last night. But it is feeling more Christmasy, day by day. Last Saturday, December 6, I hosted a St. Nikolaus tea. "A who what now?" you may be asking. And I did sort of make up the idea. Well, the tea part. In Germany, kids leave a boot out for St. Nikolaus (or just Nikolaus if you're from the north, as my family is) on the evening of December 5. The custom varies by region, but in general good girls and boys can expect to find their boot filled with chocolate, nuts, oranges, and/or small gifts. Not-so-good kids would get a switch (branch), but I don't think anyone ever does. The idea is to see how your behavior measures up so far, and whether you need to be better in the weeks remaining until Christmas! Anyhow, I decided to treat my friends to some sweets on December 6 in the form of a little afternoon Kaffee und Kuchen: I served Stollen, Lebkuchen, Strudel, Christmas (plum) pudding with hard sauce (to honor my English side), coffee, tea, and assorted chocolates. I managed to set a nice table (which may not look like much to you, but I can tell you I'm no Martha Stewart! 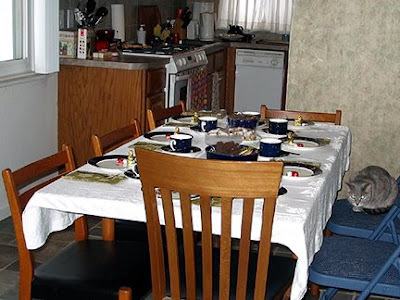 ), which is shown here before guests arrived. Fiona was being very good (perhaps awaiting some tuna in her own boot), deigning to comply with my request for her not to go on the table, by sitting the next best place on a chair. 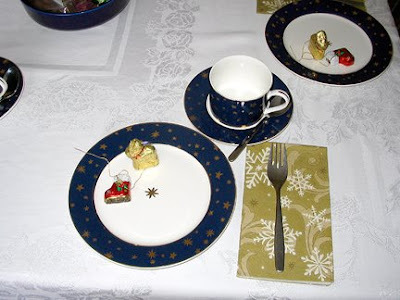 Here's a closeup of a table setting. And here are my guests, wanting me to hurry with the @#$% photo so they can eat! 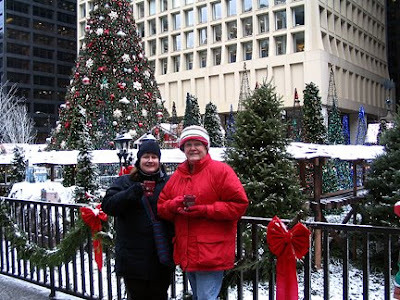 And Wednesday, my friend Carole and I took a day trip to Chicago to visit the Christkindlmarkt (German Christmas market). We took the train, shown above rolling into Ann Arbor. Choo choo choo choo woo woo! Here's a view of the Christkindlmarkt facing west, with City Hall in the background. Here you can see the red and white striped roof of a booth with a closer view of City Hall. I love its traditional architecture amidst a city of so much steal and glass (I also love the modern architecture as well, but I like the overall mix best). There were lots of booths with vendors from Germany selling all kinds of crafts and holiday items, including this one from Stuttgart, where I lived for six months some 20 years ago, doing an internship for Daimler-Benz. 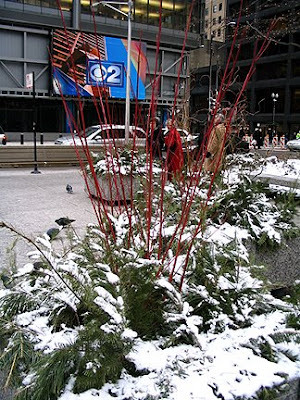 That's the Richard J. Daley Center (courthouse) in the background, plus the Chicago Picasso sculpture. The huge tree is the focal point of the market. It isn't actually one tree, but a bunch of real boughs made into the shape of a tree. In fact, almost all the greenery at the market was real (as in the little display below) and everything smelled very nice. There was an obvious attention to detail. This attention to detail, and the use of natural materials, was also evident throughout downtown. When I was in Chicago this summer, I was amazed by how "green" such a huge bustling city felt, due to the many, many flowers planted in window boxes, pots, and other nooks and crannies. It made the city feel more friendly. 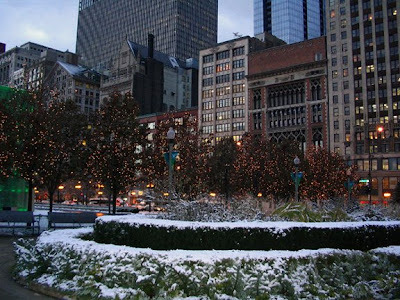 This time, the flowers were replaced by greenery (mostly real) and holiday lights, and the city still felt gardener-friendly! Many trees were wrapped in white lights and we came across all kinds of container displays. 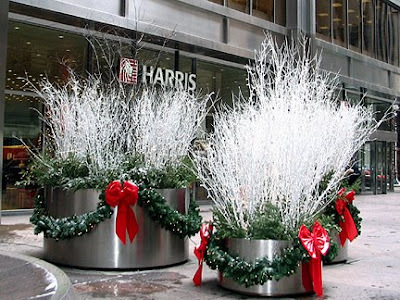 These planters were outside a bank. 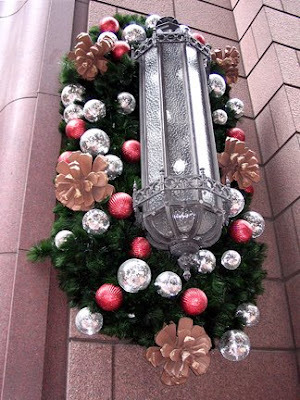 This decoration surrounding a lamp on a hotel was magnificent in real life because it was huge— the pinecones must be 12 inches tall or bigger—but that isn't obvious in the photo. 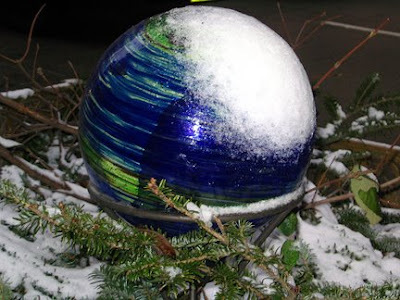 The gazing ball looked beautiful in a box container of greens along Michigan Avenue. Here some redtwig dogwood add color and dimension to this pot. 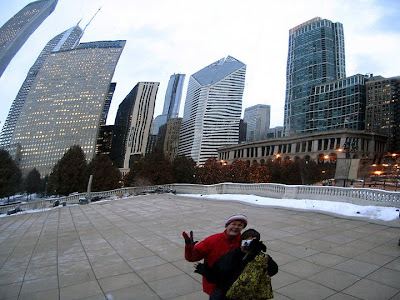 After finishing at the Christmas market, we decided to walk around a bit, as Carole had not been in Chicago before. Because I had not seen the Water Tower in any of my previous visits the last few years, I got it into my head that we should take a little walk there. The walk ended up being a lot more than little and I was afraid Carole might kill me at some point, but she was very accommodating. Let's just say we both got quite a workout that day! One of my favorite places downtown Chicago is Millennium Park, which is a green oasis in the city. Because it was more or less not entirely out of the way to walk there on the way back to the train station, I persuaded Carole to go there. 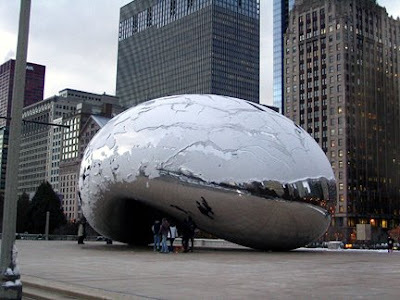 Even this time of year, I was eager to see the Big Jellybean (official name: Cloud Gate). It's just the coolest sculpture. It looks like this from far away. And like this from closeup, reflecting not only Carole and me (we're waving hello, so be polite and wave back), but the lovely skyline. It was getting dusk and time to head back to Union Station (which incidentally was about twice as far away as when we arrived), but I couldn't resist taking this photo from the western edge of Millennium Park, with Michigan Avenue in the background. It's such a beautiful view, perfect for the season. And, finally, here is my recipe for Glühwein. Verily, I feel so cultivated and domestically wise (almost like Joey at Village Voice who always posts the most fascinating recipes!) being able to share this with you. You see, my larder and cooking skills are the equivalent of the stereotypical bachelor's. While I do have a few nice retro Pyrex dishes and an honest-to-goodness (but rarely executed) flair for baking, cooking still stymies me. Most of my gardening friends are also excellent cooks, but I'm more of an excellent eater. But don't let my little confession put you off; this is a tried and true recipe that's been a big hit at my solstice bonfire parties! 1. In the large pot or pan, combine the water and sugar, and stir thoroughly. Add the cinnamon stick. 2. Bring mixture to a boil, reduce heat, and simmer while completing the next step. 3. Cut the orange in half, and squeeze the juice into the simmering sugar water. Push six cloves into each half of the orange rinds. Place the rinds face down into the pot or pan, so the side with the cloves touches the pan. 4. Continue simmering, uncovered, for 30 minutes, until the liquid is thick and syrupy. Enjoy the word "syrupy" which just sounds cool! 5. The wine gets added now. If you've made your mixture in a big pot, add the wine into the pot. If you are moving to a crockpot, pour the sugar water mixture into the crockpot, then add the wine, and then place the orange rinds in the crockpot upside down so the cloves touch the bottom of the crockpot. 6. If using the big pot, heat on low until steaming, but not simmering. If using a crockpot, cover it and set it to low and leave it sit a few hours. The longer it's heated, the richer the flavors. Taste now and then for flavor to determine when it's "done." 7. Remove orange peels and serve hot into mugs or cups. If you like, you can strain the Glühwein through a tight sieve to catch any tiny bits or orange that may have come off in the process, but I prefer the texture as is, which is still plenty smooth. This recipe makes six 4-once servings. Because I tend to make Glühwein for parties, I tend to double or triple the amounts. Monika how wonderful your tradition on Dec. 5! I love that you celebrate your cultures traditions with friends and foods and drinks from home! Looks like you had a marvellous day touring around! Thanks so much for your comment on one of my recent posts. 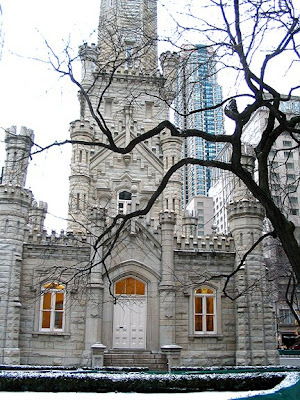 It's great to have discovered your blog and to see your lovely pictures of Chicago. Some brought back memories of a visit I made there, travelling from Ithaca, NY, when I was at Cornell. A commodities trader befriended me, at the Board of Trade, and took me onto the trading floor - an amazing experience for a dewy eyed, slightly scruffy and very broke student! This would have been in 1965 or 1966. Dylan was young, then, and we were all worried about Viet Nam and preoccupied with the Civil RIghts movements. We love trying different cultures, in our family, and have enjoyed stollen for many years at this season. Good wishes to you! My Mom and I always used to take the train into Chicago at Christmas. I miss that happy little ritual. I love the last photo, dusk coming on and lights beginning to show up clearly. This sounds wonderful! And the German is impressive! I have a local friend who visited Chicago over the weekend while her husband attended a meeting. Wish I could have crawled into her suitcase! (And now that I've seen your photos, I REALLY wish I'd been insistent!) ha.? You had a wonderful time! Love it, Monica! I'm most impressed with your traditional goodies and great photos. Looks like great time with dear friends. I'm waving ... Happy Holidays! I live so close and still haven't gone to the Christindlemart. I lived in Alsace France for a while and it was the first time I ever saw one, I'm glad Chicago has decided to adopt this tradition. That was an amazing post! I lived in Germany for 4&1/2 years when I was in elementary school and have only passed through as an adult. 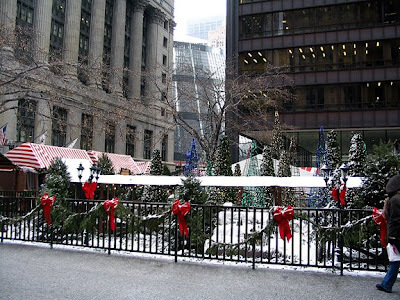 On another note, my dad grew up in Chicago and it was a Christmas destination that I always loved because of the beautiful decorations! I didn't know about the German holiday shopping and your post has made me feel that I need to revisit the Christmas of my childhood! Thank you for sharing and I'm going to try your recipe with friends this weekend! OMG! I felt like I was back in Germany starting with your St Nick day mention. One of the nicest days during the holidays in Germany. I liked the Three Kings that came around to sing carols for us, in addition to the shoes. 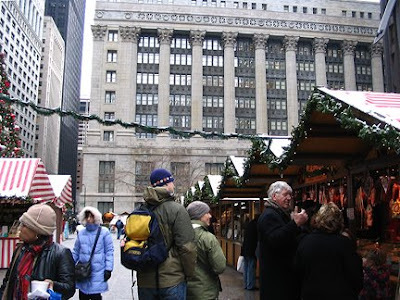 I had no idea Chicago has a Christkindlmarkt. There must be many Germans there. Pretty neat. And can you see me in the ball waving back to you and Carole? Looks like you guys had a great time. Too bad Linda couldn't come too. 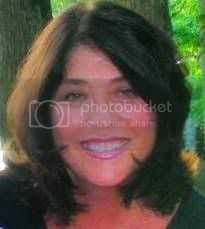 Hi Monica, looks like a very nice soiree! I'm sorry I wasn't able to join you at the Market - looks like you guys had a wonderful time in the Windy City! In the Netherlands we celebrate St Nicolas (Sinterklaas) on the 5th of December too. Early in the evening a big bag full of presents is deleived at every house by Sinterklaas and his helpers. The week before Sinterklaas children are allowed to put a shoe or boot near the hearth, wood stove or radiator, sing a few Sinterklaas songs and then the next morning they will find some candy in their shoe if they've been good little kiddies. 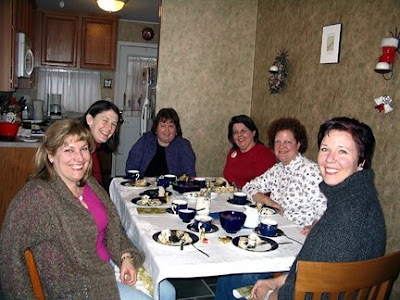 Thought it was a fun idea of yours to invite a few friends to celebrate St Nicolas. And if you need some advice on which wines to have with your Christmas dinner, come and visit Bliss, you'll not be disappointed. Thanks for the mulled wine recipe! This is the first year I've hosted a Nikolaus tee, but I think I'll do it again! I'd love to see Cornell Plantations. I also like foods of all nations. Glad I could kindle some nice holiday memories for you. Yes, I'm so excited about spring fling, and to see what's in the planter boxes in that season! I love Chicago even though I'm not a big city gal, overall. 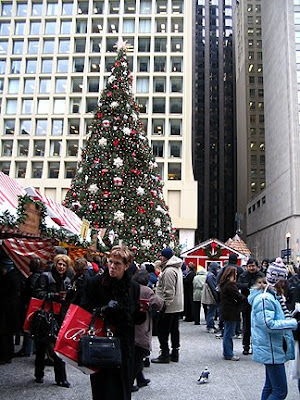 The Christkindlmarkt runs through 12/24, so you have a week left to get there! (Sorry, I make up nicknames. it's just how I am. Just ask Wildie!) I'm not a wine drinker, but I do love that recipe. We missed you but well meet again at the Spring Fling. Hooray! 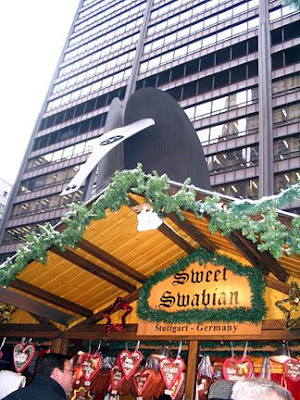 Ich haben schon vor ein paar Jahren gehoert, dass Chicago einen Christkindlmarkt hat. Leider ist es zuweit weg, um in der Adventzeit dorthinzukommen und bei uns in der Naehe gibt es keinen. Zumindest habe ich noch von keinem gehoert..
Frohliche Weihnachten, Monika! I may try your recipe for Gluhwein; it sounds delicious and easy to make. 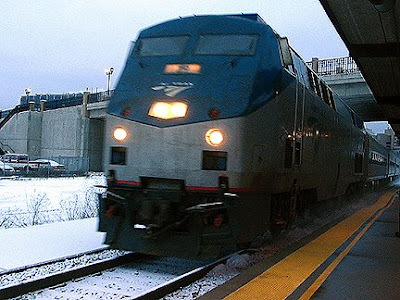 Your trip to Chicago looks like so much fun (but cold, brrr). 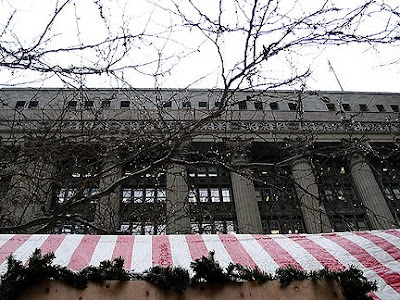 Every year I want to go to Chicago for some of the festivities and to see the city all decked out in its holiday finery, but every year I seem to get too busy to go. Thanks for sharing all these great photos with us. The Christkindlmarkt in Chigaco looks a lovely place to spend a day and what a great idea to get everyone in the mood beforehand with a St.Nikolaus tea. So far our stollen has not been opened but once it is I am sure that it will not last long ! Liebe Monica, das finde ich ja ganz schön, wie Du fern von Deutschland die alten Traditionen pflegst. Christkindl-Markt, Glühwein, Stollen... Sehr schön! Zu Deiner Frage Prost oder Prosit. Das ist eigentlich nur eine Frage, welches Wort Du besser findest. Hier im Norden von Deutschland sagen wir Prost, ich glaube die Süddeutschen sagen eher Prosit. Ist aber beides dasselbe.